Of all of the rooms in a house, the basement is one of the rooms most likely to experience water damage. When water leaks into the basement it can wreak havoc on a homeowner’s personal belongings, and it can even lead to health issues. Water can seep into furniture and carpets, destroy expensive electronic equipment and encourage the growth of harmful molds in the house. Many homeowners make use of a basement sump pump to combat the damaging effects of water in the basement, and for the most part these devices make great wet basement solutions. However, when a sump pump stops working, water can build up and troubles can arise. 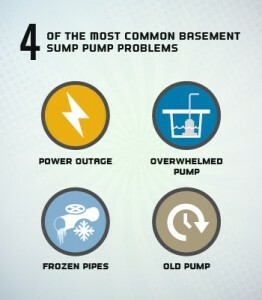 Below are some of the most common issues with sump pumps to prepare homeowners for issues in the future. Power Outage – Sump pumps run on electricity, and when the power goes out, they stop working just like any other electronic device in a home. This can be particularly problematic if the reason for the power outage is an intense storm, because water could easily flow into the basement with no way to stop it. Installing a battery backup sump pump is a great way to ensure that water is taken out of the basement even when the power goes out. Overwhelmed Pump – Another common issue with basement sump pumps is that they can become overwhelmed from working too hard. Not all sump pumps are designed to handle the same amount of water, so it is easy for a less powerful one to get overworked. When this happens, the pump can’t keep up with the amount of water coming into the basement and the room can flood. Homeowners should get a pump that can handle up to 35 gallons of water a minute to ensure that they don’t run into this problem. Frozen Pipes – Anyone who lives in the northern parts of the country is familiar with the issue of freezing pipes when the temperatures plummet during the cold winter months. When the pipe that is meant to lead water out of the basement freezes, it can create a blockage in the system. Since water from the pump can’t get through the frozen pipes, it goes back down into the pump pit, which eventually can overflow into the rest of the basement. Old Pump – Just like the rest of the appliances in someone’s home, a basement sump pump doesn’t last forever. If a pump doesn’t seem to be working properly, and the issues listed above don’t seem to be the problem, odds are the pump has reached the end of its life and needs to be replaced. Homeowners should regularly check and test their basement sump pump to see if sump pump repairs are required. This can help extend the life of the sump pump and help to avoid issues like those mentioned above down the road.